Positive Detroit: Environmentally Friendly Litterbug Joins Thurs. Night Lineup at Go Comedy! Environmentally Friendly Litterbug Joins Thurs. Night Lineup at Go Comedy! Go Comedy! Improv Theatre welcomes the film Litterbug to its Thursday night lineup during the month of July. The original film by Detroit filmmaker Mikey Brown will play at 9pm immediately following the Go Comedy! original production Space Fight. 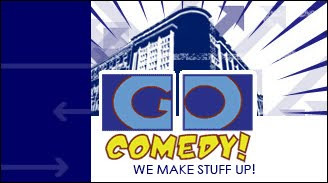 Tickets ($10 for the night or $5 per show) are available online at www.gocomedy.net, by calling 248-327-0575, or in person beginning at 7pm Wednesday – Sunday at the Go Comedy! box office. Performances of Space Fight and screenings of Litterbug will continue through July 29. An independent film shot in Detroit using almost no grid electricity, Litterbug premiered in March at the Burton Theatre, Detroit as part of the first annual Detroit Independent Film Festival. With the goal of making a feature movie spending no money, using no grid electricity, creating no garbage and on a tight three month deadline, the film was a true experiment in radical green production. This 87 minute comedy features some of Detroit’s best actors and improvisers and a soundtrack provided by a dozen Detroit bands and electronic musicians. “Camera batteries, editing laptop batteries, and video monitor batteries were charged using human pedal power. In fact, I lost 10 pounds during production,” said Mikey Brown, the film’s writer, director and cast member (Brown plays Bug, the film’s lead character). Brown, a Detroit based filmmaker and musician, has directed dozens of short films and commercials, and the cult feature, Garage: A Rock Saga. His YouTube webisode, Ced n Teri, received raves from fans and critics alike and spawned the 2009 Detroit-Wilder Award-winning stage show A Very Ced n Teri Xmas at the Planet Ant Theatre. The story follows Bug who has been performing his original, electronic music and video art at dance clubs and parties for almost a decade. But don’t call him a DJ. Feeling middle-age approaching he takes one last stab at taking his music career to the next level by signing with a new manager who has some unconventional ideas. Meanwhile the cynical and self-absorbed Bug feigns interest in the Green movement to win the love of Layla, an environmental activist. Along the way he learns a lot about green living, has some run-ins with the law and tries to finally decide what to do with his life. Litterbug will continue screenings at Go Comedy! through July 29. Written by Go Comedy! resident members Jen Hansen (Madison Heights) and Pete Jacokes (Ferndale), Space Fight takes a unique look at the “Star Wars” story exploring the politics of the Empire, the grass roots campaign of the Rebellion, and the emotional struggles of Darth Vader, while poking fun at the ridiculousness of one of the world’s most beloved sci-fi sagas. This hilarious show will entertain die-hard fans as well as those who have never seen the films. Directed by Jacokes with assistance from Hansen, Space Fight features Tim Kay (Ann Arbor) Sean May (East Point) Matt Naas (Ferndale) Travis Pelto (Canton) Chris Petersen (Ann Arbor) and Bob Wieck (Wixom). 248-327-0575, or in person beginning at 7pm Wednesday – Sunday at the Go Comedy! box office.